Jay Wesley Olson posts the coolest color effects on his @jaywesleyolson Instagram page. MODERN loves to follow him because of his beautiful balayage techniques and vibrant shades. See why he is featured on our 2017 MODERN SALON 100. 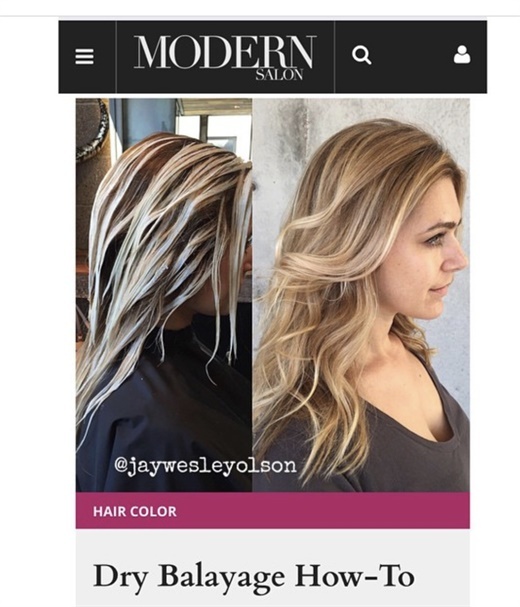 One of Jay Wesley Olson's most viral Instagram posts that was later featured on modernsalon.com. I follow: My wife because I’m obsessed with her. I follow anyone that has a positive, authentic vibe. Also @goatsofanarchy. I have a thing with goats. Pro tip: Authentic is the new black. Stand behind your posts and be proud. The rest will fall in place. How social media changed my life: Social media has skyrocketed my career, and I’m humbled by how quickly. The first time I was featured on MODERN SALON: I did a dry balayage technique, and that was the beginning of the attention I would get from my work. Thank you, MODERN!